Each week, we are inundated with articles emphasising the importance of regular exercise. On World Hemophilia Day, Porterhouse Medical explores changing attitudes towards exercising with the disease and share guides that help people with haemophilia stay active. In honour of World Hemophilia Day, we are considering the importance of sharing knowledge. Before delving into this topic, it is important to understand what haemophilia is and the impact it has on those suffering from it. Haemophilia is a genetic disorder that prevents blood from clotting . It is a predominantly male disorder, with haemophilia A occurring in 1 in 5,000 live male births . Although the exact numbers are not known, it is estimated that more than 400,000 people are suffering worldwide . Untreated, haemophilia can be extremely debilitating, making everyday activities that you and I do without a second thought very dangerous. Something as simple as falling over could cause a serious joint bleed and permanent damage. When you compare the number of papers published on haemophilia over the decades, it becomes clear that our knowledge of the bleeding disorder has increased dramatically. In the 1950s, there were fewer than 100 papers published on haemophilia, whereas more than 2,600 papers have already been published in the present decade . In addition to the increase in scientific research to date, the World Federation of Hemophilia (WFH) World Congress is, once again, expecting to attract a crowd of over 4,000 patients and healthcare professionals, building on the success of the 2016 congress. [3, 4]. These congresses provide the perfect platform for a huge amount of knowledge to be shared. The continued high levels of attendance indicate that there is a demand for knowledge in this area. Each week, we are inundated with news stories and articles emphasising the importance of staying active and exercising regularly. For people with haemophilia, it is not that easy. In the past, those who suffered from haemophilia were actively discouraged from taking part in any physical activity . It is only in the last half century that healthcare professionals have begun to encourage people with haemophilia to stay active . The change in attitude towards physical activity and bleeding disorders can be attributed to the improved treatment and resulting protection against bleeds . Today, a number of studies have been carried out in relation to the impact of physical activity on patients with haemophilia, several of which suggest that people with haemophilia gain both physical and emotional benefits from taking part in sports . In conjunction with advice from their healthcare professionals, having access to guides like these allows people with haemophilia to make informed decisions about their lifestyle. The modern, connected world allows a vast amount of information to be shared and accessed by a wide range of people. It is this knowledge that helps to drive change, and the move towards increased physical activity among people with haemophilia is an excellent example of this. 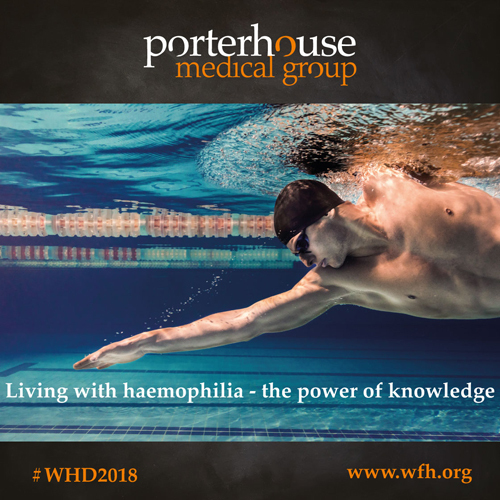 If you would like information on our expertise in haemophilia or any of our scientific services, please visit www.porterhouse.biz or contact mark@porterhouse.biz. 1. Fast facts. Available at: https://www.hemophilia.org/About-Us/Fast-Facts. Accessed April 2018. 2. PubMed. Available at: https://www.ncbi.nlm.nih.gov/pubmed/. Accessed April 2018. 3. Global networking at the WFH 2018 World Congress. Available at: https://news.wfh.org/wfh2018-global-networking-wfh-2018-world-congress/. Accessed April 2018. 4. World Federation of Hemophilia. Available at: https://www.wfh.org/congress/en/home. Accessed April 2018. 5. Fromme A, Dreeskamp K, Pollmann H et al. Participation in sports and physical activity of haemophilia patients. Haemophilia 2007; 13 (3): 323–327. 6. 10 recommended physical activities for hemophilia patients. Available at: https://hemophilianewstoday.com/2017/06/29/top-10-recommended-physical-activities-hemophilia-patient.... Accessed April 2018. 7. Negrier C, Seuser A, Forsyth A et al. The benefits of exercise for patients with haemophilia and recommendations for safe and effective physical activity. Haemophilia 2013; 19 (4): 487–498. 8. WFH guidelines for the management of hemophilia. Available at: https://www.wfh.org/en/resources/wfh-treatment-guidelines. Accessed April 2018.